Here’s my situation.... Rainwater was pooling in my driveway and it was obvious the lawn was higher than the driveway so I decided to tackle the job. After doing my research I learned it’s the counties job to dig it out, so I called them and within a few days they came out and dug what you see in the photo. It’s not as sloped as I would like it so I am going to work on that but I need some recommendations on what to do for appearance/functionality? For example gravel at the beginning of the ditch, sod the sides so it won’t erode, erosion netting, etc? This is the front of my yard so it has to look good or I could go a million other routes rather than what the county says I have to do, no dry wells, French drains etc. All advice is welcome. I have centipede grass and live in southern GA. If you call them again, will they fill it back in? I’m serious. Fill it back in and then post photos of whatever issue it was with the driveway. Only other “sure” way to deal with it would be a sump pit at the low end and a lift pump to nearest storm drain. Just my own preference here but I’d rather have water on the driveway than that swale. 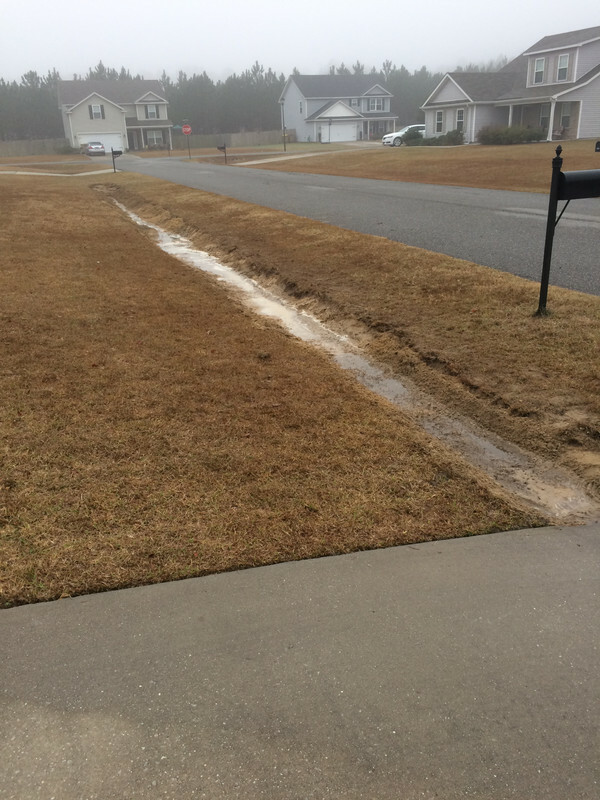 The county wont let you do a french drain? Where is that water supposed to go? I dont see a storm drain. A pipe with a grate near your driveway will be nice, so you could backfill with dirt and have a flat yard. The problem is still the path for the water to take. @GrassAndWater12 I knew someone with a similar issue. 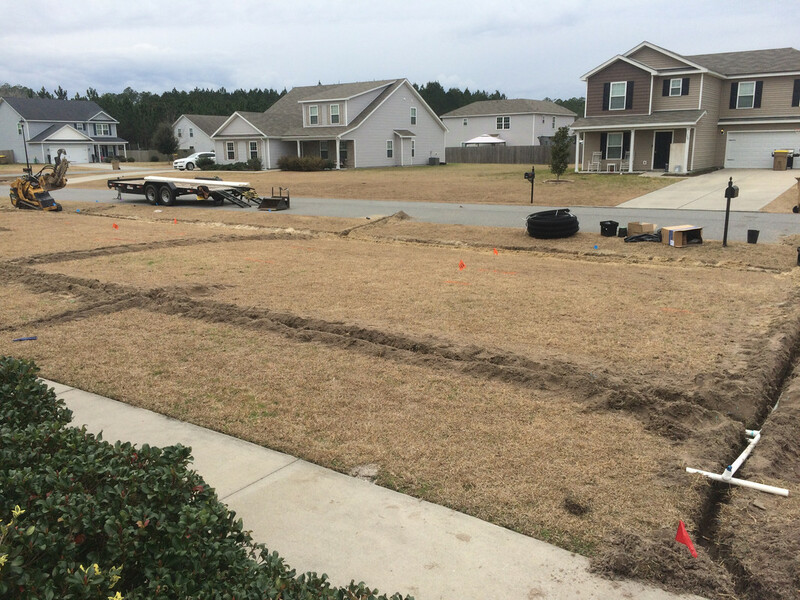 They had to get a sod cutter to roll up their lawn, regrade for proper drainage and then roll the sod back out. Hopefully you won’t have to go that route but it was a permanent fix. ....wait. I just noticed your driveway is dipped to hold water, what the heck? They could have cut a channel at the trough of the dip and installed a channel drain to keep the water moving. Yeah doesn't this create a "don't drown; turn around" situation in every driveway in this neighborhood? All the ditch-style drainage I've seen has the driveway level and a culvert underneath. Seems like an odd design to let the water flood over everyone's driveways. @GrassAndWater12 when the water was flowing did it move towards the camera or away from it? It didn’t flow at all to begin with prior to the work. I’ll attach the before pic before the county came. The arrow is where it should drain. With the ditch it flows away from the camera but not all the way to the storm drain. 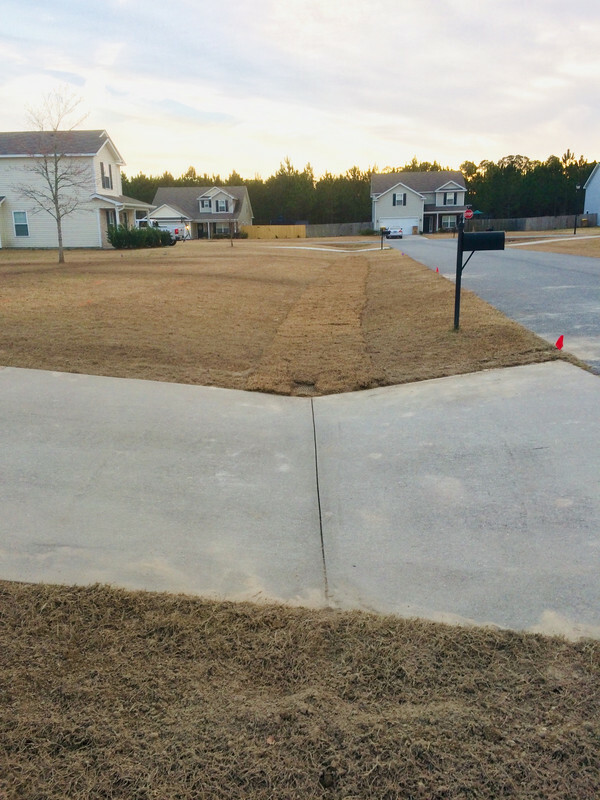 I’d like to level the yard, put a channel drain in the bottom of the driveway and resod. Waiting on a few more bids. All I know is something has to be done and fast. I live in an hoa and wife hates the ugly ditch. Last edited by GrassAndWater12 on Tue Jan 08, 2019 3:18 am, edited 1 time in total. Definitely an odd design. Cutting the sod out seems like a good first step but it needs to extend to the next property. Even if it was sloped correctly the grass would be unmowable with even a small amount of rain. Is the house next door occupied? Yes the house next door is occupied and I am on good terms with him. The county did dig on his property a few ft and he wasnt happy about that tho. He realizes that the hump from my house to his was preventing my water to go to the drain so he is on board with trying to get both our yards draining. I have contacted a few landscapers and am waiting on a few more bids before I decide on who and what. I live in southern GA if anyone would like to come out and give me an estimate and design plan I would appreciate it. Thanks again. 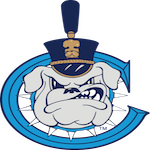 Last edited by GrassAndWater12 on Tue Jan 08, 2019 4:01 am, edited 1 time in total. This is called a " Concrete Dip-Style Driveway''. Not very common except in the south. They have a choice. Dip-style or Culvert. Yes, The county is responsible for digging it out if you have an obstruction or trash in the ditch that is preventing water from flowing. It will be up to you if you want it to look nice and install a culvert/level yard. The yard drainage is just grading, the driveway is a whole new beast to tackle. To fix it properly, you are going to need to remove the concrete , install a culvert ( pipe) in the ditch fill, grade and have a new driveway installed. Not a hard job if you have the right equipment. You will need a permit. ***** Every subdivision is required to have proper drainage per the city or county engineering dept./FEMA flooding regulations. You can pull the records from when the development was built. This will have the required culvert size for your house on file and drainage slope. Last edited by TheTurfTamer on Tue Jan 08, 2019 12:46 pm, edited 1 time in total. I don’t have much substantive to offer, other than support and, “You (and your neighbors) are not alone”: we bought an already-built house in an excessively hilly area where local inspections and any semblance of holding developers accountable were NON-existent from roughly 2005-15 and largely because local governments were willing to do (or not perform) anything, just to keep any development going, to counter the effects of the Second Depression (which totally devastated this region). 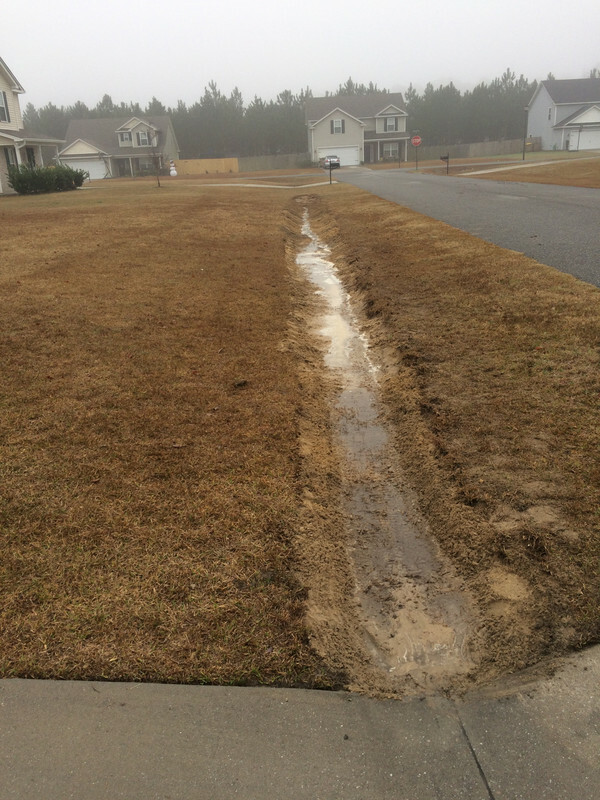 The result is nearly EVERY home site has drainage issues during heavy rains, with many simply directing runoff directly onto adjoining properties. There are a couple places ‘round here where you DO NOT want to be, “at the bottom of the hill.” Thankfully, we have an active County Pemits Dept now and an HOA that is trying to work with effected homeowners, rather than just making things worse. Last edited by 440mag on Thu Jan 10, 2019 7:24 am, edited 1 time in total. 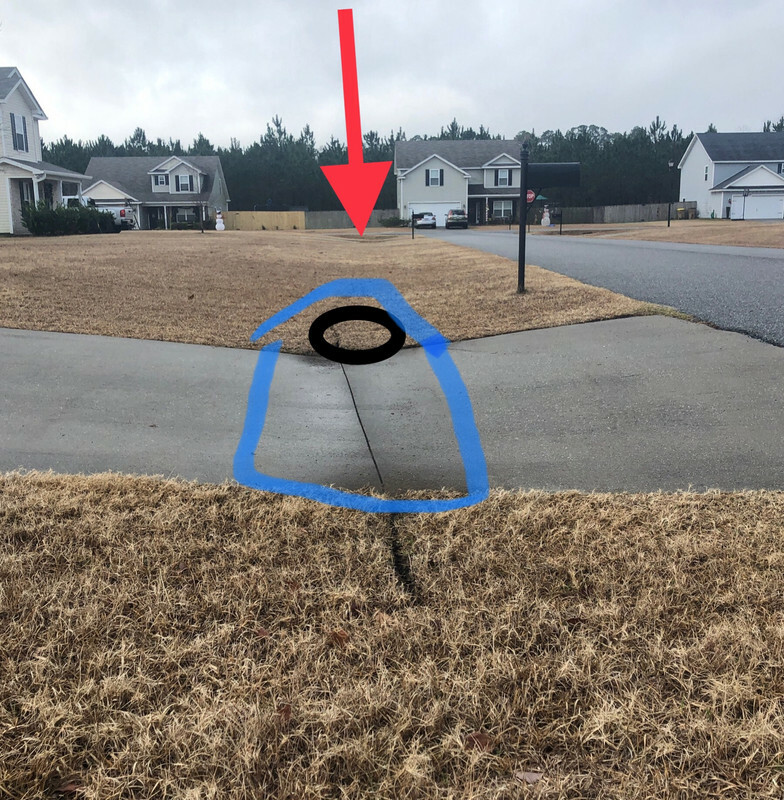 A landscaper installed a catch basin at the driveway connecting it to a French drain and a catch basin at the end of my yard right before my neighbors yard just if it ever happened to fill up it would have somewhere to exit. He covered it up with lawn fabric, stone, sand and new sod. He also gave me an awesome price on extending my irrigation which I took him up on. Had a few rains and zero water pools up in the driveway or yard or makes it to the end of the French drain. Thanks for all the advice. I hope this can help someone else with their drainage issue. Where does it drain to? Street looks like it’s above grade for most of your yard. Yes the street is above grade from the rest of the yard. The neighborhoods original drainage design was a swale in everyone’s yard going to a big ditch/drain on all the corners that goes into a nearby pond. So to answer your question my French drain (if it ever reaches the end) will come out of another catch basin near my neighbors lawn and into the neighborhood corner ditch on the other side of his house. So far the rain has never made it to the end of the French drain and has 100% solved the water pooling up in my driveway while filling up other houses driveways in the neighborhood. Next step is to level out the where the irrigation lines settled and even out the where the new sod butts up to the existing lawn but not until full green up and my first fert app. I think a yard per M of masonry sand once it’s growing will do you well! This time of year I like to put down Milorganite but that’s just personal preference. My thoughts exactly! I have a bag of Lesco 33-0-17 left over from last year so I believe I will start with that. Plans as of now are to wait a week or two to give it additional time to green up, scalp and bag, level out the sand, put down the Lesco same day, and use Milo on the next app. I’m fairly new to the grass game and totally up for suggestions. I put down 0-0-7 Pre-Emergent and have 2,4,d on standby to spot spray later on in the year. How long should I wait after putting down the Lesco to apply the milo?